"Sylvester Stallone stars as Barney Ross, leader of The Expendables, a tight-knit team of skilled combat vets turned mercenaries. Hired by a powerful covert operator, the team jets off to a small South American country to overthrow a ruthless dictator. Once there, they find themselves caught in a deadly web of deceit and betrayal. Using every weapon at their disposal, they set out to save the innocent and punish the guilty in this blistering action-packed thriller." "The Expendables are back. The team signs on for a mission that looks like an easy paycheck for Barney and his band of old-school mercenaries. But things quickly go wrong, and one of their own is killed by a psychotic terrorist-for-hire. Hell-bent on payback, they cut a swath of destruction through enemy territory and wreak havoc upon their opponents. In the midst of the mayhem, they must also shut down an unexpected threat in the nick of time -- preventing five tons of weapons-grade plutonium from falling into the wrong hands." 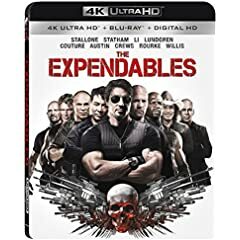 Those are the official descriptions for The Expendables and The Expendables 2, now available on 4K Ultra HD from Lionsgate, which has provided NewTechReview with NFR copies of each title for review. What do you get when you put Sylvester Stallone, Jason Statham, Jet Li, Dolph Lundgren, Randy Couture, Steve Austin, Terry Crews, Mickey Rourke, Bruce Willis, Chuck Norris, Jean-Claude Van Damme, Arnold Schwarzenegger, and Liam Hemsworth on the same set? You get two of the best over-the-top action movies that pay homage to the action flicks of the 80s and 90s. Instead of today's CGI-infested films, we're treated to real gunfights, explosions, fight scenes, and hand-crafted special effects. Although the first film suffered a bit from shaky camera scenes to where some of the action was a blur, the second film (directed by Simon West) employed a more reserved camera technique. Now some people may disagree with my "two of the best...movies" designation, but keep in mind, I'm not talking about the storylines. It's true that the plots are formulaic and simple, but a good action movie is about... well, the action, as well as just being fun to watch. The Expendables and The Expendables 2 provide plenty of action, fun, and funny one-liners. Of course, there are plenty of more serious and sophisticated action films, which are also great, but that's not what The Expendables is all about. So why are we talking about these films now since they've been around since 2010? Why 4K Ultra HD, of course. Both films are delivered on dual-layered UHD66 discs and presented in 4K Ultra HD. They are encoded with HEVC H.265 and shown in 2160p with an aspect ration of 2.35:1. If you think the films looked good on Blu-ray, just wait until you see them here. Not only has the overall quality improved, but the action looks better than ever. Since many of the scenes in The Expendables were shot at night, it has a darker tone to it, where The Expendables 2 is brighter because it's mainly daytime scenes. Both display excellent color quality with the Neon signs of the first film and outdoor scenes of the second. The discharge of weapons provides a display of explosive color, while the larger onscreen explosions are epic with debris flying everywhere and multicolored embers floating all around. Other aspects are also just as detailed with closeups showing individual beads of sweat and bloody wounds. You won't find any video anamolies to speak of here. Both films provide Dolby Atmos sound that provides some of the best bone-rattling audio you'll hear on a 4K release. Dialogue is clean and clear so you won't have any trouble discerning conversations except perhaps in terms of speaking accents. The real joy, however, is in the battles. If you turn up the volume, your neighbors will think your place has suddenly turned into a war zone. You'll feel every rumble, hear every bullet whiz by, and even be able to discern explosive debris falling all around you. * Audio Commentary - Sylvester Stallone goes into great detail about how and why he made the film. * Inferno: The Making of The Expendables - a 92-minute featurette (or mini-film even) that covers just about everything there is to know about what went on behind-the-scenes. * From the Ashes: Post-production - a 26-minute featurette that provides more behind-the-scenes footage, but this time about editing and producing the film. * Marketing Archive - this provides a trailer and some TV spots. * Ultimate Recon: An Interactive Bonus View - this provides a picture-in-picture option that plays and gives you access to bonus material while watching the film. * Audio Commentary - Simon West provides a basic commentary for the film. * Gods of War: Assembling Earth's Mightiest Anti-Heroes - a 21-minute featurette that covers the film's cast. * Big Guns, Bigger Heroes: The 1980's and the Rise of the Action Film - a 25-minute featurette that talks about the actions and stars of the 80s. A definite must-watch for fans. * On the Assault: The Real Life Weaponry of The Expendables 2 - a 14-minute featurette that looks at the weapons used in the film. * Guns for Hire: The Real Life Expendables - a 25-minute featurette that looks at real-life mercenaries. If you love action movies and action stars, then you'll love both these films. If you already own them on Blu-ray, but you have an upgraded 4K theater system, they are worth buying again for the excellent immersive experience.